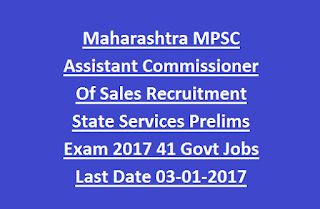 MPSC ACTO Assistant Commissioner of Sales Recruitment/Exam 2016: Maharashtra Public Service Commission invites online applications from the Maharashtra State bonafide candidates to recruit the Assistant Commissioner of Sales posts under Finance Department of Maharashtra. There are total 41 Asst Commissioner vacancies available in this MPSC Finance Department Jobs recruitment through State Services Exam. Applications will be accepted through online from 14-Dec-2016 and closing date is 03-Jan-2017. Applications to be submit online @ Maharashtra PSC portal @www.mahapsc.mahaonline.gov.in. Selection for this Asst Commissioner of Sales Officer recruitment of MPSC will be through State Services Preliminary written Exam and mains examination followed by personal interview. MPSC Assistant Commissioner of Sales Recruitment 2017 vacancy details, age criteria, exam pattern, qualification, online application process and important dates and more details are given below. 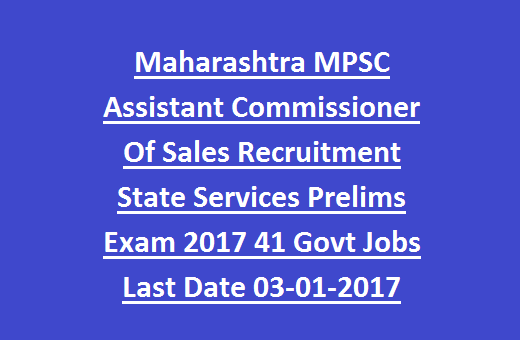 See the Notification of Maharashtra PSC Assistant Commissioner of Sales Jobs Recruitment Exam 2017. Age limits are applicable as on 01-April-2017. Selection for this MPSC Assistant Commissioner Jobs recruitment will be in 3 different stages. Candidates have to apply online for these vacancies through the official website of MPSC. Last date for submission of application form online is 03-01-2017. Provide valid communications details to receive alerts later regarding exam dates and admit cards information. Last date for fee payment through SBI E chalan is 04-01-2017. Click here toapply online for MPSC State Services Exam 2017 for Assistant Commissioner ofSales.